WE ARE THE NUMBER ONE tour operator in all the Riviera MayaON TRIP ADVISOR check out our reviews!!!! !• Private tour.• Enjoy at your own pace.• Private air-conditioned vehicle with pick up and drop off at your hotel or rental home.• Enjoy Tulum Archaeological site with a "Living Dreams Mexico" private guide.• Climb to the top the tallest pre-Columbian structure in the northern Yucatan (not mandatory).• Journey on bicycle or bike taxi (included)• Gourmet beachside lunch in the powdery white sand beaches of Tulum.• All included (entrances, on board the transportation soft drinks, beers, water, snacks).• The most talented and passionate guides in the region.• Secluded Locations.• No gimmicks, No upsells.• Photos during your expedition are a courtesy from Living Dreams at the end of your day. Witness this archaeological gem nestled on Mexico's Caribbean coast. Enjoy having a certified guide on board your private vehicle providing interesting and insightful information on the way. Journey on bicycle or bike taxi (included) to the tallest pre-Columbian structure in the northern Yucatan. Climb to the top and enjoy the endless views of the jungle. well-deserved gourmet beachside lunch in the powdery white sand beaches of Tulum. 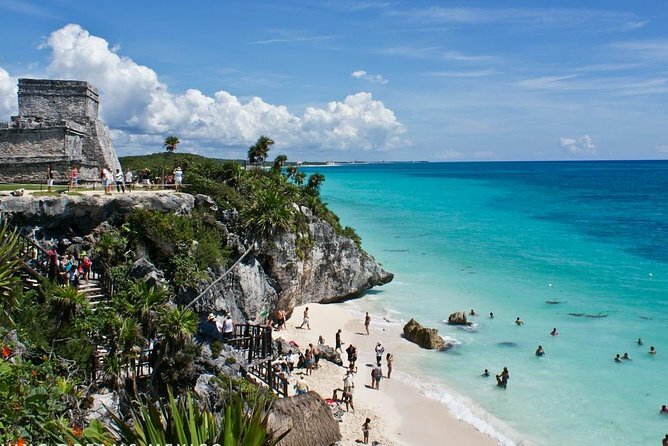 Returns to original departure point or a different within the Riviera Maya and previously adviced.